If you’re constantly stepping on kibble after mealtime, this may be why. Feeding time is a happy time when you have a dog. Your dog is nearly bouncing off the walls when you’re getting ready to fill up the food bowl. Usually when we put food in our dogs’ bowls, they dive right in and start eating. But some dogs display odd behaviors at feeding time. One behavior that may have you scratching your head is when your dog carries his food away from the bowl before he eats it. If your dog does this and you can’t figure out why, we have a few ideas. Some dogs — particularly those in multi-dog households — may carry their food away as a type of pack mentality. Before dogs were domesticated, they often ran in packs. The more subordinate pack members would carry food away to hide it from other members of the pack. “When dogs in the wild make a kill, the outranked animals drag pieces of food away so they don’t have to fight the leader or a more dominant canine for it,” says Dr. Julie Albright-Keck, DVM, DACVB, assistant professor of veterinary behavior at the University of Tennessee College of Veterinary Medicine. Dogs aren’t looking to start a fight because that’s dangerous. So trying to put the food out of sight is a compromise between giving up their food and fighting for it. If you have more than one dog, you can try feeding them separately to see if that helps. In single-dog households, it may be easier to use a crate or block the exits to the room so your dog can’t carry food elsewhere. Dogs feel loneliness just like people do. If you’re in another room and he is alone in the kitchen, your dog may carry his food to where you are to eat it. “Dogs naturally long for companionship, so he may just want to see you or be near you while he eats,” says Cornwell. Dogs are family members but often don’t eat with the family. His carrying the food to where you are could be a sign that he simply wants to be part of the family dynamic. As a pet sitter I’ve seen this behavior firsthand. One of my clients simply will not eat if she’s all alone in the room. When I sit for her, I usually set up my laptop nearby or even bring her food bowl outside so we can enjoy the sunshine together. I’ll sit or stand nearby while she eats. This makes her happy, and she eats right from the bowl every time. If you have metal dog dishes, your dog may be annoyed or frightened by the noise they make when they clang together. Even the sound of a dog tag hitting the bowl can startle a dog, so she may take the food and carry it away from the source of the noise. The easy answer to this is to swap the metal bowls for plastic ones. Then your dog isn’t startled by the metal-on-metal jangling and can eat in peace. 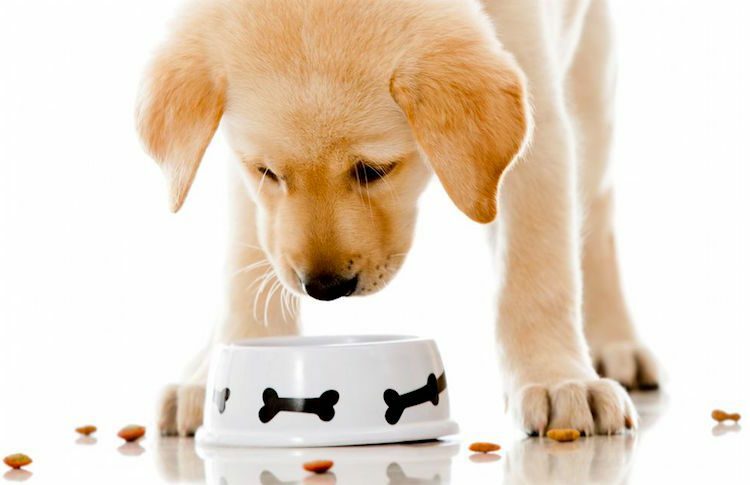 You can also try paper plates — although, depending on the type of food you feed your dog, this could get messy. When in the wild, dogs or wolves would often drag remaining prey away and hide it somewhere. Your dog could be doing the same thing. 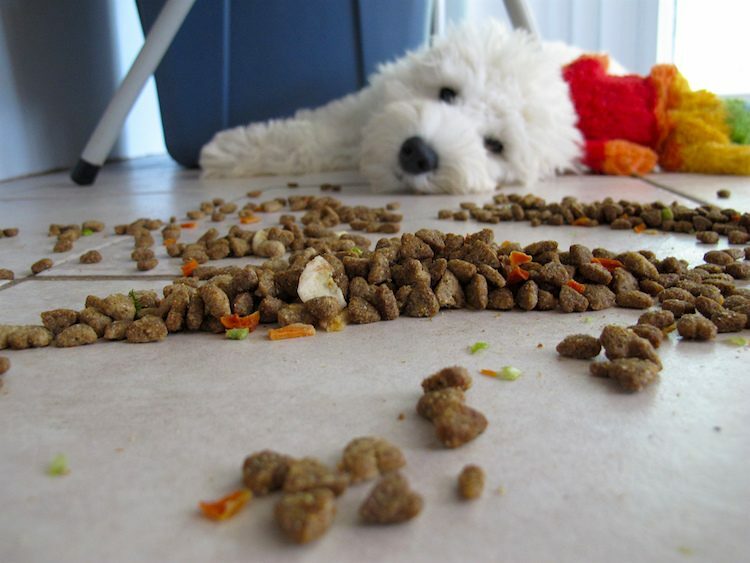 If you stumble across dog food in random places, your dog may be “caching” some of his food. The solution, again, is simple: Make sure you’re not overfeeding him, and then block off the exits to the room he normally eats in. If your dog is carrying food away, it may be because of one of the above reasons. As always, check in with your veterinarian any time your pet displays a behavior that concerns you.